If you’d like to see some samples of my fiction, you can browse through my “A Taste Of” series, along with helpful links on where to find more! Pugmire is a science-fantasy world (heavy on the “fantasy”) in which evolved dogs explore a world left to them by humanity. There are a lot of different ways to experience Pugmire, which are detailed at realmsofpugmire.com! I was a writer on Walking Dead: Our World! 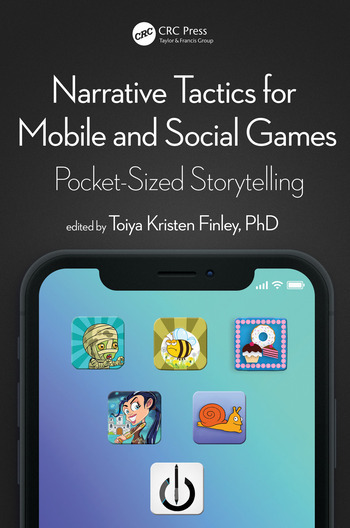 I wrote a chapter for Narrative Tactics for Mobile and Social Games! I was a writer and game system designer for Tunnels & Trolls Adventures! I was one of the writers for the Futurama: Game of Drones mobile game! I’ve done production, writing work, and/or voice acting on the following Earplay products! My interactive novel Ratings War is an 80,000 word cyberpunk noir story about an investigative reporter who has to balance entertainment and the truth. Available on iOS, Android, Steam, Kindle, and Chrome. I was a content designer for five years on World of Darkness before it was cancelled. I’ve also written some of the missions for the epic arcs in EVE Online, introduced in the EVE Apocrypha expansion. Watson is Not an Idiot is a compilation, revision, and expansion of my “Tour de Holmes” essays from this blog. If you’re a first-time reader of Sherlock Holmes, or just want to start a more critical analysis of the work, this is a great place to start! Slices of Fate is a collection of microfiction, essays, and short stories from the early part of my career. It’s produced by Flames Rising Press. I’ve also done a lot of work acting as the main (or only) developer for various role-playing game products. If I didn’t write for a book at all but I was the developer, it’s in this list.